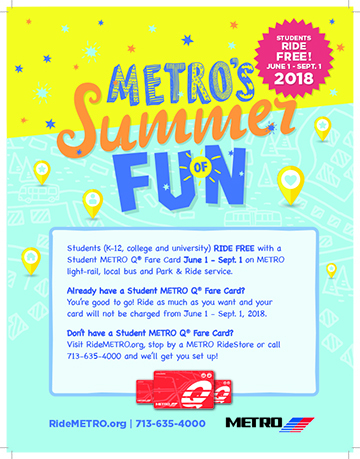 The Summer of Fun pass is a unique fare card offering K-12 (and college) students free rides on all METRO light-rail, local bus, and Park & Ride service June 1 through Sept. 1, 2018. This entry was posted in News and tagged Metro on May 8, 2018 by HISD Communications. Zackery Johnson, drum major for Kashmere High School, takes METRO to school every day, and his dream is to one day be part of the famed Texas Southern University’s Ocean of Soul Marching Band. But you may already know all of this if you’ve seen or heard the latest ad for Metro on TV or on the radio. The ad, part of Metro’s “This is My Metro” campaign, features Zack on the bus and performing on the field. This entry was posted in District II - Rhonda Skillern Jones, High Schools, News and tagged Kashmere High School, Metro on September 19, 2016 by HISD Communications. The back-to-school commute for students who take METRO has just gotten easier. METRO’s New Bus Network has revamped local bus routes to give its riders straighter, simpler routes that connect students to more places, more often. This entry was posted in News and tagged Metro on August 12, 2015 by HISD Communications. For as long as anyone can remember, the METRO bus stop beside Hartman Middle School has been little more than an unassuming street corner, a spot where commuters can sit on the dusty curb and dangle their feet in the road while they wait for the bus to arrive. 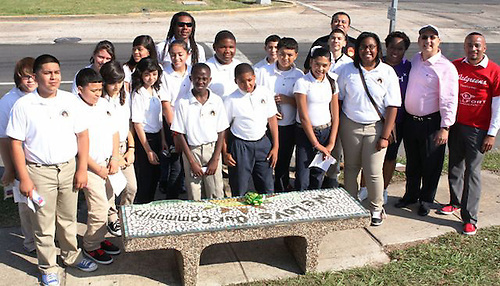 But on Monday, June 3, a group of Hartman Middle School students worked to change that by installing a colorful bench as a part of Mayor Annise Parker’s Love Your Block grant program. This entry was posted in Middle Schools and tagged bus stop, Hartman MS, Metro on June 6, 2013 by HISD Communications. The Houston Independent School District will introduce a new law enforcement mentoring program during the upcoming Parent Night event. HISD’s Parent Engagement Department has partnered with the HISD Police Department, METRO Police Department, and Houston Police Department to create a mentoring program for at-risk students. The officers will serve as mentors at Peck Elementary School, and Attucks, Cullen, Deady, Jackson, Key, McReynolds, Sugar Grove, and Welch middle schools. Former NASA astronaut Dr. Bernard A. Harris Jr. will serve as the keynote speaker. In 1995, Dr. Harris became the first African-American to walk in space. Who: HISD Parent Engagement Department, HISD Police, METRO Police, and the Houston Police departments, former NASA astronaut Dr. Bernard A. Harris Jr., HISD students, parents, and administrators. What: The HISD Parent Engagement Department will announce a new law enforcement mentorship program in partnership. When: Wednesday, December 5, 2012: 6p.m.-8p.m. This entry was posted in Uncategorized and tagged HISD, Law enforcement, mentoring, Metro, NASA on December 3, 2012 by HISD Communications. Having a male role model can make a significant impact on the academic and social well-being of a child. Sadly, many students at HISD lack a prominent male figure in their lives. Fortunately, HISD has several longstanding and new partnerships within the Houston community that are helping to give students a male mentor. On Tuesday, Oct. 16, officers from the Houston, HISD, and Metro Police departments gathered at Peck Elementary to kick off a new initiative that provides male police officers as role models and mentors for students. This entry was posted in Uncategorized and tagged mentor, mentorship, Metro, police, Real Men Read on October 30, 2012 by HISD Communications.